What I find truly fascinating about the Wall of Sound is that once you delve into the Phil Spector story, you realize how far-reaching his artistic vision was. Spector’s inner circle and team of studio cats, subsequently dubbed the Wrecking Crew by legendary drummer Hal Blaine, included a lot of would-be Spectors. I don’t mean that in a derogatory sense. I’m just acknowledging the fact that over the years many of them spent time in studios across LA, trying to work out the basics of the formula that made Spector the arch-alchemyst of widescreen pop. More often than not, they too created gold in Gold Star Studios and beyond. Their efforts proved that the Wall of Sound could be achieved if one had carefully, or even secretly, taken notes during the long hours serving in Spector’s legion of session men. A particular favorite of mine is Nino Tempo [born Antonino LoTempio] – a sax player and singer who befriended Spector during the early 60s and soon found himself at top of the list whenever a session was called. He is probably the one who came closest to Spector on a personal level acting as much as a friend as his right-hand man and soundboard in the studio. 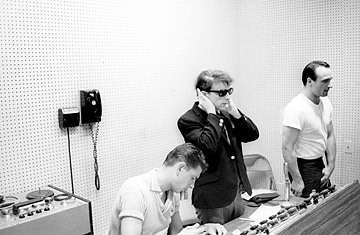 Engineer Larry Levine, Phil Spector and Nino Tempo in the booth during a Gold Star session. I think it’s fair to say, Nino had a better look into Spector’s thoughts on the Wall of Sound than most. I like him a lot due to his very smooth, crooning vocals that beautifully compliment the few Spectoresque songs he recorded with sister April Stevens or alone. He wasn’t as prolific as other would-be Spectors. But when he hit a homerun, the ball sure broke through the stadium wall! Case in point – check out this lip-synch performance of ‘All Strung Out’ with sister April on the Lloyd Thaxton Show in 1966. ‘All Strung Out’ is one of a handful of great Wall of Sound tracks Nino recorded with or without April. Most of them can be found on the duo’s ‘All Strung Out’ album which has been re-released on CD. ‘The Habit of Loving You Baby’ on that album is like a carbon-copy ‘All Strung Out’ – I can’t figure out which one I prefer. Noreen Corcoran – ‘Love Kitten’ (1963) – a fun and fast tune typical of the lighter girl group fare. Nino Tempo & April Stevens – ‘All Strung Out’ (1966) & ‘The Habit of Loving You Baby’ (1967) – both of these were clearly written with a Righteous Brothers blue-eyed soul feel in mind. Nino Tempo – ‘Boys Town (Where my Broken Hearted Buddies Go)’ (1967) – a bit of Pet Sounds-era Beach Boys thrown in for good measure. Let’s leave for now with Nino himself talking about his time with Phil in an excerpt from the 1980 ‘Da Doo Ron Ron’ documentary. Take it away, Nino!